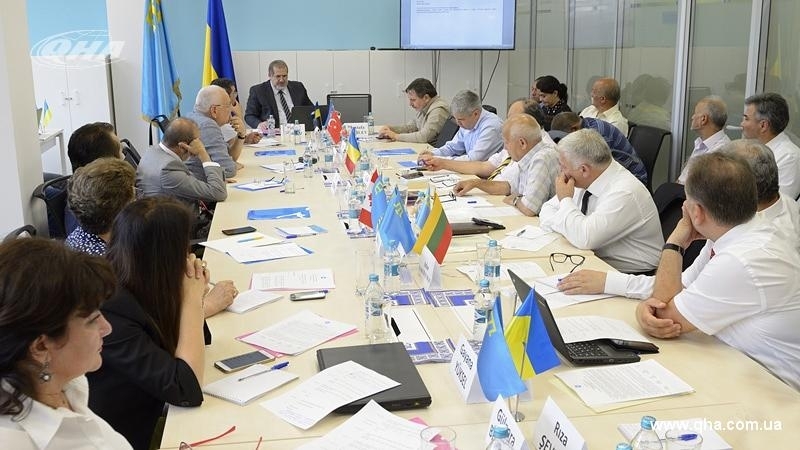 On July 29, the ninth meeting of the Executive Committee of the Crimean Tatar World Congress is held in the Ukrainian capital. The ninth meeting of the Executive Committee of the Crimean Tatar World Congress began in Kyiv, the QHA correspondent reports. The meeting is attended by the Chairman of the Congress Refat Chubarov, members of the Executive Committee, members of the Audit Commission and representatives of the Crimean Tatar diasporas from Turkey, Romania, Lithuania, Kyrgyzstan and Canada, in particular General Secretary of the CTWC Namik Kemal Bayar, the Head of the Crimean Tatar Association of Culture and Mutual Aid in Turkey Mukremin Shahin, the Head of the Qurultay Audit Commission Ozenbash, the Head of the Crimean Tatar Association of Culture and Mutual Aid in Istanbul Dzhelal Ichten, members of the Coordination Council Samir Menan (Romania), Adas Yakubauskas (Lithuania), Rustem Irsay (Canada), Vasfie Aliarova (Kazakhstan), Member of the Coordinating Council of CTWC from Crimea Zevdzhet Kurutumerov, members of the Mejlis Gayana Yuksel, Riza Shevkiev, Abmedjit Suleymanov, Gulnara Bekirova, Vice-President of the CTWC Lenur Islyamov, Chairman of the Democratic Union of Muslims of the Turkic Tatar of Romania Jelil Eserdjep, the Deputy Minister of Temporary Occupied Territories and Internally Displaced Persons Yusuf Kurkchi, and representatives of the youth wing of the CTWC and Crimean Tatar activists. The leader of the Crimean Tatar people Mustafa Dzhemilev and Mufti of the Muslims of Crimea Aider-Haji Rustamov planned to join the meeting a little later. A place at the table for Ervin Ibrahimov, a Member of the Executive Committee of the CTWC who had been kidnapped more than a year ago, is still allocated. His father Umer Ibrahimov visited the meeting. – use of the provisions of Budapest Memorandum, that was signed in 1994, by the Government of Ukraine. Reference: the Crimean Tatars World Congress is a structure that united the Crimean Tatars who lives in their historical homeland, in the Crimea, as well as in the Diaspora in various countries of the world (Turkey, Romania, Poland, USA, Canada, Lithuania, Western Europe and Central Asia). The first three meetings of the Executive Committee took place in Romania and in Ukraine (in Kyiv and in Chonhar, the settlement of the Kherson region). The fourth meeting was held in Vilnius (Lithuania), the fifth session of the Executive Committee of the CTWC was held in the Eskishehir Turkish city. The sixth meeting and others till the ninth meeting took place in Kyiv.